After all, the grasshoppers, cicadas, and silkworms that I have eaten in the past just seem so benign—so boring—compared to eating a scorpion. Watch me eat a scorpion! Wangfujing Snack Street (王府井小吃街) is a popular culinary alley selling everything from the common to the bizarre. Common foods would include barbequed squid on a stick, cow stomach, and stinky tofu. Yes, those are all common street snacks (in China, that is). Bizarre foods include starfish, seahorses, and scorpions skewered and grilled with cumin and salt. Both Chinese and western tourists alike giddily snap pictures of the writhing scorpions awaiting their imminent demise. These buns do not have any dog meat in them! So do people actually eat scorpions? A simple internet search yielded little detailed information. 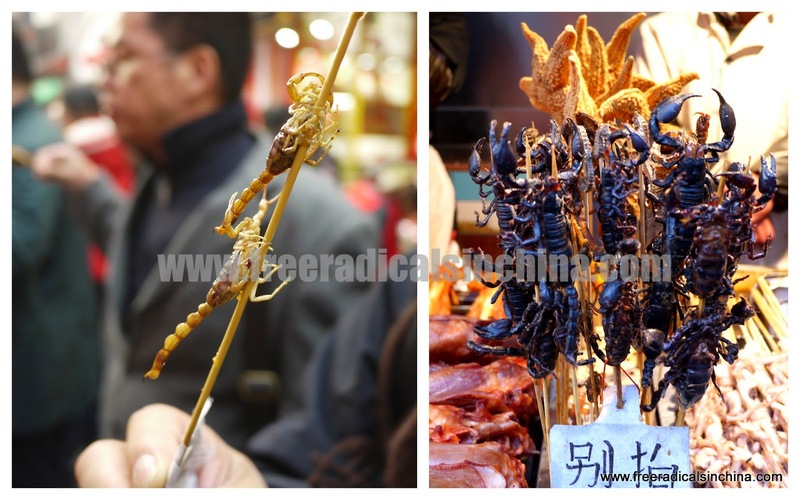 Some articles mention that China, Singapore, and Thailand prize fried scorpions as a delicacy. Only a fraction of the over 1,000 species of scorpions are poisonous, so scorpion epicures need not fear dropping dead. The Wangfujing scorpions are farm-raised for eating—sort of like farm-raised shrimp sold in American superstore Costco. The K Family happens to be the right kind of people. For 15 RMB, we picked out a skewer of three small live scorpions to share. Xiao K was unsure if she could do it, but at my egging, she couldn't resist scorpion cuisine. Mr. K savored his scorpion, as we should expect from a red-blooded Cantonese guy. Cantonese people eat everything! Mrs. K ate a skewer of three by herself—actually, I am not sure if she actually swallowed one. After chewing, she'd gag and spit the poor half-chewed artho out. She did that three times. She is either a glutton for punishment, or she hoped the taste would improve. I don't think it did. Three weeks later, I found myself again strolling Wangfujing-- this time with fellow Californians and husband and wife team, C & J. They had been very generous to me that day. I had forgotten my wallet and didn't even have a miao* on me. They had bought me a Starbucks coffee and a fancy dumpling lunch at a fancy dumpling restaurant—not to mention they also had delivered 10 pounds of quinoa and tortillas from California (thank you, Auntie C!). I owed them at least a bit of entertainment. Taste: A very hard exoskeleton requiring a lot of chewing. The salt seasoning is gone after chewing for such a long time, leaving a lingering bitter, medicinal taste. Someone with strong gag reflexes would gag. Maybe fried scorpions will catch on in the US? * Miao – unit of Chinese currency, about $0.02 USD. English Translation: Don't be afraid of eating scorpions. How many chews to get to the center of a giant scorpion? The Great Wall, China's crown jewel, should top the list of must-dos for any Beijing visitor. Ideally, a trip to the Great Wall should be done when the sky is blue. OK, considering that Beijing is normally shrouded in a gray haze, gray-blue skies are acceptable. But when the Air Quality Index exceeds 400 ppm (that's really bad), a trip to the Great Wall is a waste. Who wants to pay an entrance ticket to see thick-as-pea-soup smog? We can do that for free anywhere. Last Thursday, Beijing smog thwarted yet another outing. I had put aside my normal Thursday activities to play Great Wall tour guide for the K Family. We decided to save the Great Wall for another day, but we can still experience Beijing's other not so crowning jewel: the Silk Market (秀水街 Xiùshuǐjiē). The Silk Market is 5-story mall full of knock-off brand products with salespeople yelling at passersby in English, “You want to buy some-sing here?” If you so much as glance at something, you are pounced by calculator-wielding salesperson quoting an outrageous price. When Xiao K expressed interest in long sleeved Abercrombie and Fitch (A&F) hoodie, the saleslady said it was only 320 Rmb ($50). As a seasoned Beijing expat, I have an idea of how much fake brand things should cost—and that was too much. Xiao K looked at me for help. I spoke up, “20 kuai!” The saleslady shot me a nasty look. She turned back to Xiao K, “Ok, 150 kuai.” I gestured to Xiao K, no, no, too much. To say the saleslady was not happy with me might be an understatement. She physically nudged my arm indicating, You get out of here. Then she told me “This shirt is for the beautiful girl, not for you and you are not beautiful.” “Not beautiful” in Chinese can be translated as “ugly”. Yes, that's right. The lady outright called me ugly. Of course, it's hard to take such an insult seriously in a place like the Silk Market. The saleslady then insisted that 100 Rmb is her cheapest price. But Xiao K is a quick student. After a few more exchanges, Xiao K ended up paying 40 Rmb. And the saleslady ended up calling me ugly again. Chinese Phrase of the Blog: 太贵了！Tài guìle! A poorly rated shop in the Silk Market, for real? Not California blue, but I will take it! The skies are blue here in Beijing. Not azure blue, not sapphire blue, not cobalt blue, not even sky blue—let's call it APEC blue. The Asia-Pacific Economic Cooperation (APEC) is group of 21 countries that meet annually to discuss promoting economic growth in – you guessed it – Asia. So what happens when representatives from the world's most influential economic powers (aka the USA) come to town? Just as your mother meticulously cleaned the bathroom, polished the fine silver and hid the dirty laundry from sight before the neighbors came for dinner, Beijing likewise prepared for its honorable guests. The schools and companies closed, car traffic was restricted, and surrounding factories went on hiatus. That's it smog, be gone! Here comes the APEC blue sky. After all, it would be such a shame if Obama developed the Beijing cough like the rest of us. "APEC blue" describes the blue sky during the APEC meeting. ClimateAnnouncement is Ambitious — But is it a Deal? Love this blue sky, but is it for real? Once a week, I travel by subway to a bustling station where I, along with about a million other people, spill into an adjacent intersection. 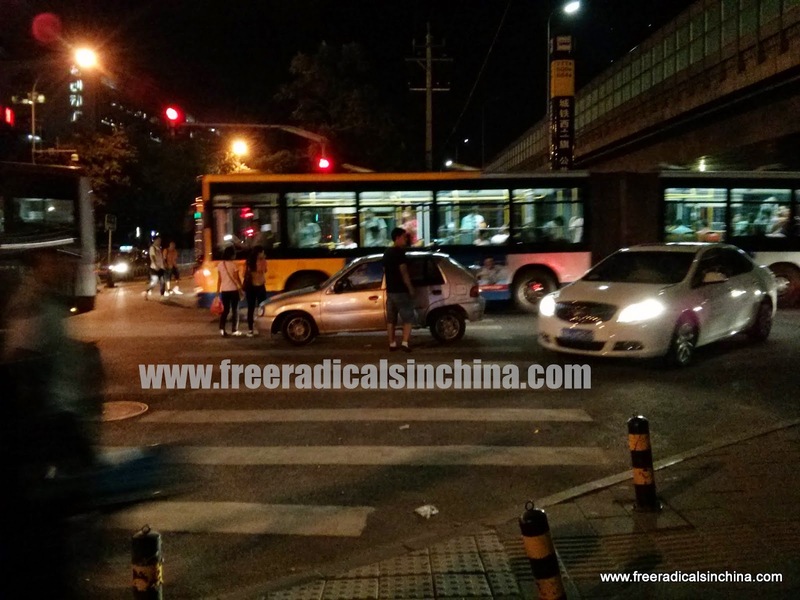 This intersection is clogged with cars and buses honking at each other and at the pedestrians weaving through any unoccupied space. It doesn’t matter what color the light signal is; no one is moving. Here I begin my search for a driver to take me 15-minutes west to a weekly tutoring job in a private home. There are two types of taxis available for hire. The first type is a “real” taxi driver. Real taxi drivers are registered with the government. Fares are based on time and distance, so the cab fee is whatever the taxi meter displays. 15 RMB is 15 RMB. 50 RMB is 50 RMB. No haggling required, so a real taxi will probably charge a fair price (I say probably because there are dishonest registered cabbies that have ways of ripping people off). Because payment is straight-forward and relatively hassle free, I much prefer a licensed taxi. Sometimes, such as during rush-hour, real taxis are in short supply. A second or only option is to hire a “black” taxi. Black taxis are not registered with the government so their inflated fees are up for negotiation. Fare haggling can be a pain, so this process must be approached while 1) not in desperation, 2) with humor, and 3) a clear idea of how much is a fair price. Now, as far as I can tell, these drivers don’t have much going on standing on the street corner yelling at unresponsive passersby. I would think they would be eager to give a willing passenger a ride for a decent price. But no, this wouldn’t be China if there wasn’t a lot of yelling, pleading, cajoling and mild insulting. Usually, the price starts out at 30 to 40 RMB. Based on the real taxi fare, I reply with 20 RMB. The driver then will respond waving his hands at me indicating that 20 RMB is too cheap. After all, look at all that traffic. His cab is air-conditioned. 30 RMB is the cheapest he can do. Furthermore, I am American so I must be rich. 30 RMB is no big deal. Sorry buddy, 20 RMB is the fair price. I often take taxis and I always pay 20 RMB. If you don’t accept this price, I will just ask somebody else. Next thing I know, I am midst of three or four cab drivers negotiating with each other. I keep piping up, “20 RMB!” Eventually, one will relent and agree to 20 RMB. The others will laugh and tell him how ridiculous that he would accept 20 RMB. Then I jump in the cabbie’s car and remind him not to trick me (“别骗我!”) and take me straight to my destination (“我要直达去那儿!”). After assuring me we will leave soon, the cabbie will then shut the door. Trapped inside, I am left with my irritation and wondering how long until I reach my destination. Meanwhile, he stands outside and cajoles another passenger into his car. 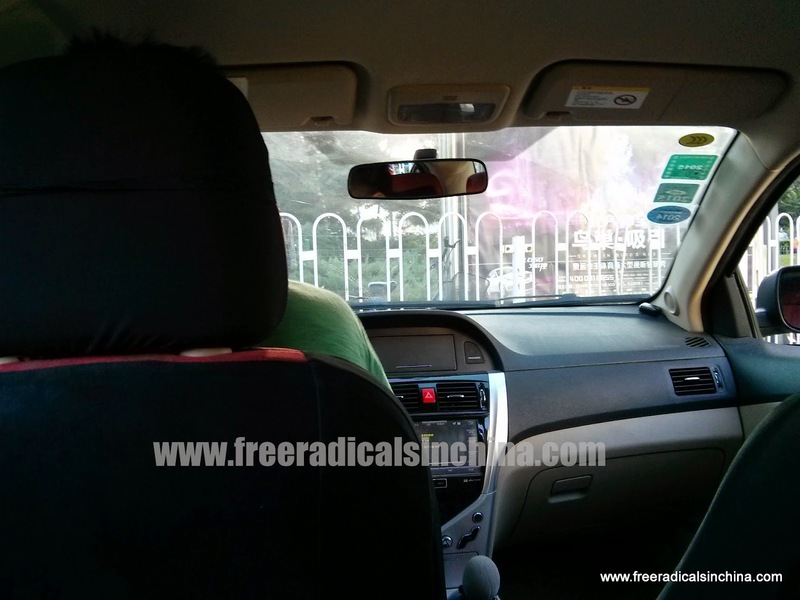 Now the cabbie has two passengers and can make twice the profit in one trip. Inevitably, my destination is farther than that of the other passenger, so I take a detour to my drop-off. My 15 minute ride (if we were taking a direct route) turns into 30 minutes. Once stuck in the car, there isn't much I can do except view this extended ride as a good opportunity to practice Chinese and get exposed to other Chinese accents. Cabbies usually like to chat and ask all kinds of questions—some of which I would prefer not answering: “How much money do you make? How much money did you make in America? How much do you pay in rent? Why don’t you have children?” Sometimes they like to give advice: “You should make more money. You could work more and then you can make more money.” Most of the time it takes me a while to understand cabbie chit-chat: “If you were looking for a boyfriend, would you want a Chinese boyfriend?” (Or something like that. Not really sure.). Sometimes I clearly understand the cabbie and I wish I didn’t: “I like you. Can you give me a hug?” (Only happened once and I emphatically replied with, “Don’t want!” as I quickly jumped out of the car). Several times over the summer, I came across a youngish driver named Wang Guang. He always agreed to 20 rmb and never picked up additional passengers. Over time, we developed guanxi. Guanxi (关系) literally means “relation” or “relationship.” In the context of China, having guanxi with someone does not mean romance; rather, guanxi can mean friendship, connection, or understanding. Wang Guang knows my price and he knows not to smoke around me. Lately, I have been teaching him a little bit of English and he has been telling me how to say car brands in Chinese. He really wants to see some American money, so I might give him a US Dollar as a gift. Then we really will have guanxi. I suppose going through so many black taxis paid off. Wang Guang is only a phone call away. My ride takes 15 minutes. No haggling. No waiting. And best of all, no chance of running into Hugging Cabbie again. Example sentence: 没办法。我要打黑车。Méi bànfǎ. Wǒ yào dǎ hēichē. English translation: My only choice is to hire a black taxi. Taking a ride with Wang Guang. Right now he is making a crazy U-turn. This is what a real taxi looks like: It has a sign that says "TAXI"
Year after year, summer after summer, I grew up with the same familiar living room scene. The oak trees hedging the house had yet to reach maturity, so the summer sun would blaze through the floor to ceiling windows, bringing the inside temperature to an uncomfortable toasty. Below the ceiling fans and the over-worked air conditioner, my dad would relax in his lounge chair watching CNN and drinking diet root beer. He wore only two things: his navy blue shorts and headphones. I have been having flashbacks of my dad’s round, bare belly. Why? Because when it’s hot in this city, Chinese bellies appear. The bellies come in all shapes, sizes, and ages. Some bellies resemble Buddha’s firm rotundness. Some bellies long and thin like a green bean. Men eating dinner, watching mahjong games, watching their baby grandchildren, sitting around shooting the breeze—all with their shirts tucked up exposing their brown midriffs. At the same time, one hand gingerly rubbing around the belly button. This mahjong game is intense! Westerners, like us, chuckle at this fashion faux pas. But to the Chinese, airing out one’s midriff is as sensible as turning on the AC. Despite having studied abroad in the U.S., desperately wanting to leave China, and having a Frappuccino addiction, our very Westernized Chinese friend responded to our snickering with this unamused piece of logic: “They do that because it’s hot.” Right, it’s hot. Let it all hang out. Beijing, after all, is sweltering. Now a week into the September, the daytime temperatures are bearable. As summer wanes so should the belly exposure. But I will always think fondly of my dad sitting in front of the TV, remote in one hand, a cup of diet root beer in the other, and his Chinese, hairless chest and belly in plain sight. Thank goodness manners are cultural, and not genetic. He always wore a shirt when my friends came over. That would have been so embarrassing. The upside of eating in a street: No dress code! Are we back at Great Leap again? Saying AYO! Gotta let go! Saying AYO! Baby, let’s go! What better way to spend a drizzly Monday afternoon than to get under Rihanna’s Umbrella-ella-ella-eh-eh-eh? Or answering out loud Yeah, Yeah, Yeah, Yeah to Bruno Mars’ invitation to Go, Go, Go, Go-Go marry him? Feeling a little Under Pressure, and just want to Beat It? Yes, there is a place of escape where you can be Barbie Girl, in the Barbie World, and It Don't Matter If You're Black or White. Better yet, we can Throw Our Hands Up in the Air Sometimes, Saying AYO! Gotta let go! And Dance, Dance, Dance, Dance because that’s our Plans, Plans, Plans, Plans. Yes, the Single Ladies have come together for a unified Bohemian Rhapsody. Yes, it was a Karaoke Monday. Karaoke is tremendously popular here. A Karaoke establishment, called KTV, seems to be perched on every street corner. KTVs are on blatant display in malls and embellished with fake marble columns, or tucked away in alleys blending in with hanging laundry and market stalls. For 40 RMB (6.50 USD), six of us girls spent two hours in a cozy room equipped with a rotating disco ball and accompanying alternating colored lights, two television screens, a table with booth seats, two microphones, a selection of cymbals, and a box of matches. There we sang with all our hearts to the tunes of a whole lot of bubbly sweet American, British, and Korean pop music. We danced, we laughed, and we did not consume one single drop of alcohol. And even though I have the least pleasant of singing voices, I belted it out the loudest. Wǒ chànggē hěn nántīng, kěshì wǒ fēicháng xǐhuān chànggē. English Translation: I sing terrible, but I still like to sing. Korean girls go gaga for Adam Levine's "Daylight"
Aussies and Koreans unite! This Aussie can read and sing in Korean? Gentlemen? Anyone want to put a ring on it?